As an ‘old fox’ preparing for Pioneer retirement, I would like to take this opportunity to address recent events concerning our university as a whole, and The Pioneer in particular. On Friday, Dec. 2, I got to meet with President Kimberly Cline, along with three of her fellow administrative members. It was an interview planned on my part, and well received on theirs—a friendly chat with some valuable substance and minor disagreements. However, since I was urged to turn off my recorder before the start of the interview (a method extensively used by journalists who want to get the facts right), and most of the conversation was asked by the interviewees to be held off record (in other words, the information discussed I am not allowed to forward your way), there ultimately wasn’t much news-worthy to report on. 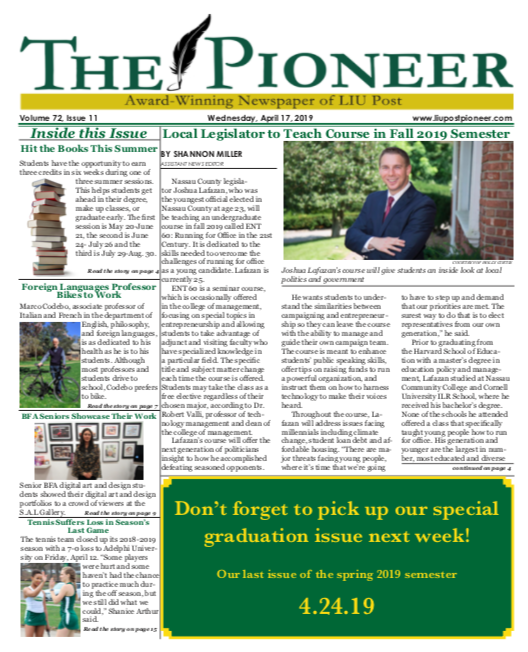 The Pioneer will continue to strive for fair and balanced reporting, and will follow up on the leads given at the meeting. I apologize on my behalf for stealing valuable time off a busy university president’s schedule to no direct outcome, but believe the discussion may lead to a ‘greater good’ moving forward.